Tour to Mongolia. Mongolia tour. Tours to Mongolia. Travel to Mongolia. Mongolia. Trip to Ulaanbaatar. Legend tour. Mongolia tour. Tours to Mongolia. Travel to Mongolia. Mongolia trip. Shamanism. Mongolia. Gobi desert. Ulaanbaatar. Ulan-Bator. Ulanbator. Ulaan Baatar. Tours - Trip - travel - Mongolia. The tours in Mongolia with "Legend tour" gives you the unique chance to see the virgin nomadic culture and lifestyle, saved only here until this days. Shamanism and Lamaism are both contributed to nomadic traditions and are growing up nowadays. Most interesting to visit are Gandan monastery (Ulaanbaatar), Bogdo Khaan monastery (Ulaanbaatar), Erdene Zuu (Kharakhorum) and Manzshir. The Gobi desert in Mongolia, the second biggest desert on our planet, is a treasure-house of fossilized dinosaur's bones and eggs which exhibited in the Mongolian Natural Historic Museum in Ulaanbaatar. Opposite to the dry sand dunes in the south, you can visit also the green mountainous north with the Khovsgol Lake (Khuvsugul lake), Mongolia's largest and deepest freshwater lake. Classic tour to Mongolia. Your trip will start with excursion in Ulaanbaatar, capital of Mongolia. At this tour there are endless possibilities for hiking and trekking through gorgeous hills and amazing cliffs in Terelj area of Gorkhi Terelj National Park. At the residence of Chinggiz Khaan and field camp of Temujin Khaan you return to ancient times when Mongolian Khaans ruled the world. Horse riding tours to Mongolia. At this tours you will discover the remarkable beauty of Arkhangai aimag in Mongolia, as we horse trek through this beautiful grass steppe region, stopping to visit local families who herd horses. We’ll camp along the shores of many of the area’s rivers with the opportunity to hike and explore on foot. Trekking tours to Mongolia. Mongolia is a good place for trekking. The green steppes and beautiful mountains with hills, Mongolian rivers will give you opportunity to enjoy your trekking. You will visit local nomadic families to see their life. In our tours you will have a chance to trek in the National Parks of Mongolia that are perfect for this kind of adventure. Fishing tours to Mongolia. Fishing in Mongolia is one of the last adventures for fisherman who already were fishing all over our planet. Here lives the world's largest salmonid, the Taimen, also known to the Mongolians as „River Wolf". Taimen can reach up to 200 pounds and 2m long. Fishing here is catch and release with barbless hooks as it is one of the world's healthiest and biggest Taimen population. Automobile tours to Mongolia. This automobile tour of Active adventure will show you the highlights of Mongolia. You will explore the beauty of this land, the culture of it's people. At this tour you can get the knowledge of Mongolian history, National Reserves, National Parks, Lakes and of course the Culture of this great and big country. Short tour around Ulaanbaatar (Duration of rounds from several hours till 2 days). At these short tours you will be driven not so far from the capital and there you can see the beauty of Mongolian nature. Visitors can spend the night at Ger camp and then hike around the camp, to ride a horse, to visit nomads. At Terelj National Park to walk around famous "Turtle Rock" created by nature. Mongolia - Russia (Baikal) tour. Using this tour you will visit two countries, Russia and Mongolia. The program will start in the capital of Eastern Siberia, Irkutsk, where you will see the site of foundation of Irkutsk fort. Next day you will be driven to Baikal lake (70 km from city). At the local museums you will get the chance to introduce with flora and fauna of Baikal lake. In Mongolia you will meet with the endless possibilities for hiking and trekking through gorgeous hills and amazing cliffs in Terelj area and introduce with the culture of Mongolian nomads. Mongolia - China tour. 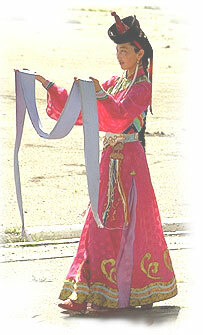 On this trip we will guide you to the highlights of Mongolia and China. Mongolia and its countryside will charm you. You will know better the history of Mongolian empire. In China you will visit the Great Wall – symbol of China and Tian’anmen square – the biggest square in China. Individual tours to Mongolia. The tours in Mongolia gives you the unique chance to see the virgin nomadic culture and lifestyle, saved only here until this days. Shamanism and Lamaism are both contributed to nomadic traditions and are growing up nowadays. Most interesting to visit are Gandan monastery (Ulaanbaatar), Bogdo Khaan monastery (Ulaanbaatar), Erdene Zuu (Kharakhorum) and Manzshir. The Gobi desert, the second biggest desert on our planet, is a treasure-house of fossilized dinosaurs bones and eggs which exhibited in the Natural Historic Museum in Ulaanbaatar. Opposite to the dry sand dunes in the south, you shouldn’t miss the chance to see also the green mountainous north with the Khovsgol Lake, Mongolia's largest and deepest lake. We can suggest you different kind of tours from two days to four weeks. Chinggis Khaans cavalry riders show 2008. New!! !